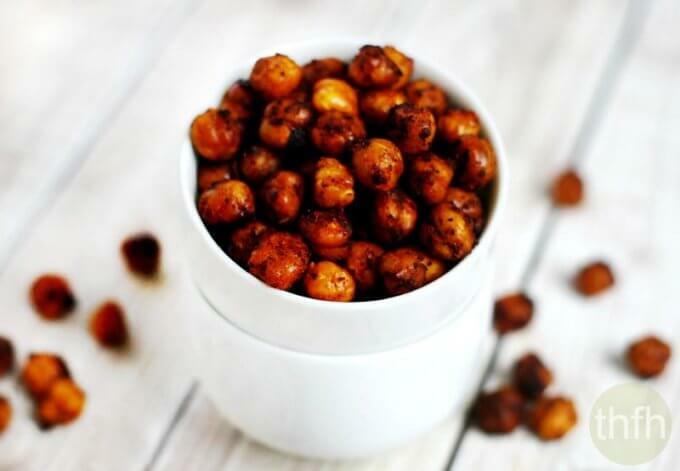 These Roasted Chickpeas with Chipotle and Lime are a tasty little snack that are really easy to make and are ready to enjoy in under 30 minutes. They are a healthy replacement for chips or other savory snacks and have lots of fiber and protein. You can mix these up in less than 5 minutes and they only take about 20 minutes in the oven. This recipe makes enough for 1 – 2 servings, so if you are making it for a crowd, you will need to double or triple the recipe…because they will disappear fast! If you like the chipotle + lime flavor combination, try my Roasted Cauliflower with Chipotle and Lime recipe for another healthy snack idea. Want more healthy snack recipes? Check out Lemon Dill Kale Chips, Superfood Fruit Nut and Seed Snack Mix, Vegan Oven Baked Zucchini Chips or my Clean Eating Cookbook with an entire chapter of 20 healthy, clean eating snack and side dish recipes just like this one that you will love! Step 1 Add the avocado oil, chipotle powder, lime juice, garlic powder and Himalayan pink salt to a small bowl and stir until well combined. Drain and rinse (with purified/filtered water) the cooked chickpeas, then pat them dry with a clean cloth or paper towel. Add them to the bowl of seasoning mixture and gently stir until the mixture is evenly distributed and all the chickpeas are covered. Transfer them to a baking pan lined with parchment paper and spread them out evenly. Bake at 425 for approximately 15 - 20 minutes, tossing them about halfway through, taking care not to let them burn. Optional: squeeze extra lime juice over them and serve (best when hot). The photographs for "Roasted Chickpeas with Chipotle and Lime" by Karielyn Tillman of The Healthy Family and Home are licensed under a Creative Commons Attribution Non-Commercial 4.0 International License and cannot be used without my written permission.